Early this week, rain was in the forecast for Bakersfield, the southernmost city in the Great Central Valley, but UC Cooperative Extension farm advisors were unconcerned, reported John Cox in the Bakersfield Californian. The rain never materialized, and that was good news for Craig Kallsen, UCCE Kern County citrus and pistachio advisor. "In general, on the valley floor, if it's raining, somebody's going to get hurt," he said. Kallsen said the ideal situation for farmers is when rain and snow fall on the mountains, providing water to be harnessed for irrigation. Because of the dry, warm climate in the South Valley, even after it rains, "It's probably going to dry out really rapidly." UCCE orchard systems advisor Mohammad Yaghmour said rain is a bigger concern in the spring when almonds are in bloom. By this time of year, most almonds have been harvested, largely removing the threat of mold. "For almonds, luckily, most of the harvest is almost over," he said. "I don't anticipate seeing much effect." 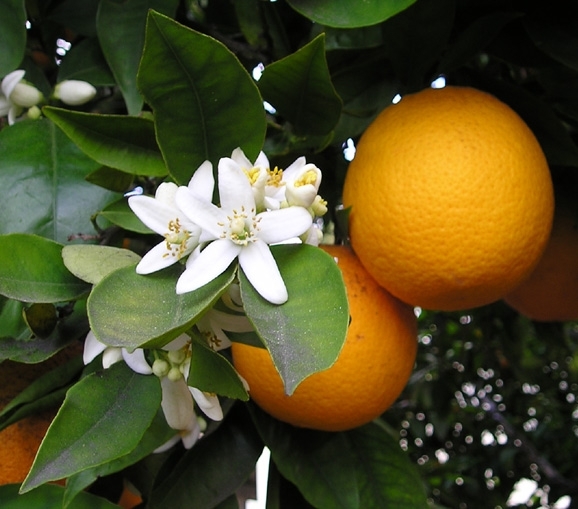 Kern County citrus fruit were not impacted by the early October storm system in California.